This tutorial deploys a Hyperledger Composer blockchain-based business network that invokes Clause to execute Smart Legal Contracts. This tutorial does not require writing any code, but familiarity with the terminal and installing tools like Docker, nvm, Node, npm is required. Mac OS X, or a Linux VM is required. It should take about 1 hour. The state of a set of assets and participants are stored on the blockchain, whilst smart legal contracts are externalized for execution on the Clause platform. First complete the Cicero Perishable Network tutorial. You should now have a functional Hyperledger Composer business network running on your local Hyperledger Fabric. 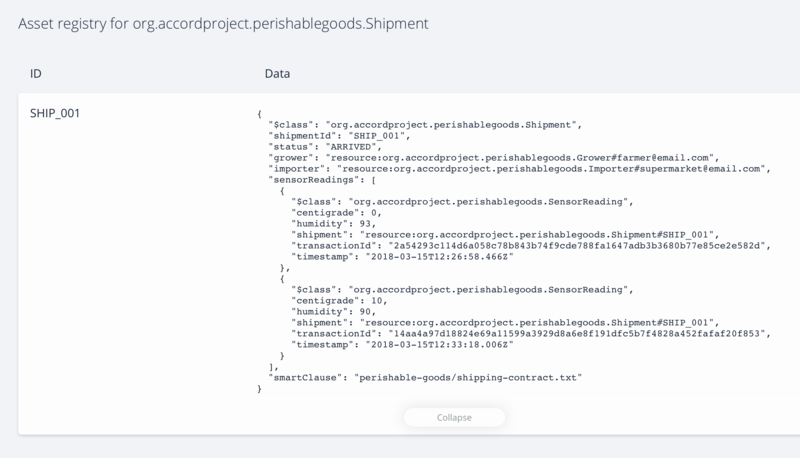 Before we can modify the logic of the Hyperleger Composer business network archive we need to create an instance of the Perishable Goods template and add it to a contract. Open the Playground web application and edit the file logic.js to invoke the Clause server, replacing clauseId and with the URL you copied in step 9, above. You also need to modify how the totalPrice attribute is being read from the result. Your code in logic.js should look similar to the code below. If you resubmit the ShipmentReceived transaction it will now invoke Clause, calculating the penalties using your Smart Legal Contract. You can check that the correct total price was calculated by checking the accountBalance property of the Grower and Importer participants. The Grower should have received a credit, while the Importer should have receivd a debit.